The substantial village and parish of Hingham sits in Central Norfolk astride the B1108 road from Norwich to Watton. 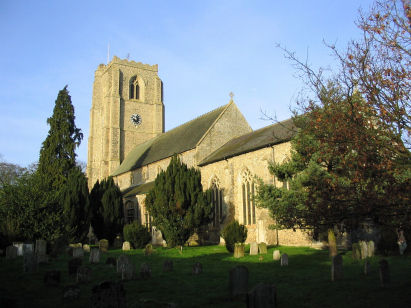 The village is roughly 5 miles west of the market town of Wymondham. Hingham has always been a substantial settlement and warranted a market. However, the village failed to flourish beyond a population of about a thousand and when the railway failed to link it to the rest of England it preserved the village at more or less its present size. Despite recent growth the winding narrow B route to Norwich is still a deterrent to commuters. St Andrews church, situated to the west of the market place and dominating the main village crossroads, is a massive structure. 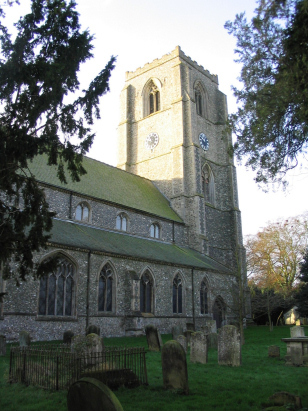 It is unusual for Norfolk in being built in the Decorated style largely during the 14th century. At 160 feet long and with a tower standing 120 feet high the church really is an imposing edifice. Like most Norfolk churches there was a restoration during the Victorian era but much of the original has fortunately been left untouched. The period of this transcript is covered by three registers deposited with the Norfolk Record Office, the first, a 1600-entry book, is followed by two standard 800-entry registers, the latter runs beyond the period of this transcript to 1884. All three register are filmed and they are available on microfiche 9 to 16 in the collection of the Norfolk Record Office. The quality of these elderly fiche is frankly rather poor. The images are misty, faint and often unclear. It is fortunate that the parish is covered by the excellent images of the LDS Familysearch site as these were used in preference for large sections of this transcript. As a consequence this proved a rather straightforward transcript to prepare although it has to be stated that at times the handwriting was less than good. It is, however, hoped that few errors will have crept in to the preparation of this transcript.